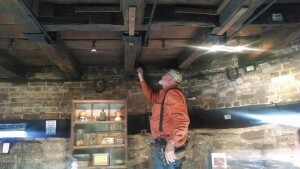 With the 250th anniversary of the construction of the Block House approaching in 2014 concerns were raised as to the structural integrity of the masonry foundation and walls, the condition of the timbers and what exactly was needed to preserve and restore this historic building so that it would continue to stand as a testament to our city’s past. A conditions survey was conducted in March 2011 by Mark D. Clark of Southwest Restoration in Roanoke, Virginia. Based on the conclusions of that comprehensive conditions survey a scope of work to address the areas of concern identified was prepared by Ellis L. Schmidlapp, President of LDA Architects – Landmarks Design Associates. 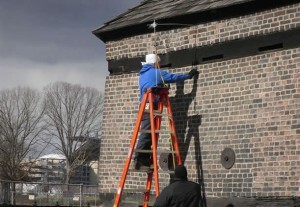 In January, 2013, the Fort Pitt Society launched a 10-month preservation and restoration project at the Block House. The project, funded with gifts from an anonymous donor and the Colcom Foundation, provided the needed repair and restoration work to preserve and protect the structure for the next 250 years. TUV Rheinland employees prepare an upper level gun loop for an x-ray examination. Photo credit – Fort Pitt Society. 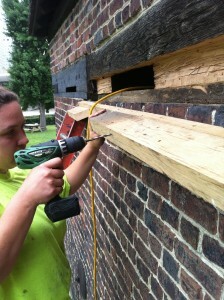 The first step in the preservation project was the repair of the gun loop timbers, many of which are still original to the 1764 construction of the Fort Pitt Block House. Dirk Taylor, president and principal of Taylor Structural Engineers of Pittsburgh, was selected by the Fort Pitt Society to oversee this portion of the project. In order to determine which gun loops were in most need of repair from rotting, Taylor decided to do a radiographic mapping of the timbers. This was a noninvasive process which used X-ray examinations of the gun loops. 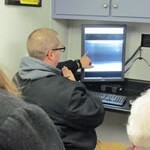 Taylor selected TÜV Rheinland, an international firm with offices in Aliquippa, PA, to conduct the X-ray exams at the Block House in January 2013. TÜV used radioactive materials which passed through the structure of the timbers and recorded images on film. These images provided a look into the interior of the gun loops, displaying areas of rotting and other damage. Viewing one of the x-ray images of the gun loops. Photo credit – Fort Pitt Society. After reviewing the X-ray images, Taylor was surprised to find that the deterioration of the Block House’s gun loop timbers was not nearly as bad as originally expected. The images also revealed that rotting was occurring from the exterior of the timbers, working its way into the interior of the wood. Now that a “map” of the rotting was completed, Taylor could move on to the actual restoration and preservation work to correct the damages. The firm selected to complete the gun loop restoration project was Allegheny Restoration, located in Morgantown, WV. Because of the nature of the work involved and the safety of its visitors, the Block House was closed during late June/early July 2013 as the gun loop preservation was conducted. Jon Smith of Allegheny Restoration drills holes into a gun loop timber in preparation for the epoxy injection. Using plans based on the X-ray images, Allegheny Restoration set about injecting structural epoxy into those internal areas of the gun loop timbers where decay was most severe. The epoxy filled in the rotted areas, hardening as it dried inside the wood. This hardened epoxy will give strength to the rotted wood, enabling it to remain in place for years to come. Some sections of gun loop timbers were so heavily rotted that they had to be replaced. 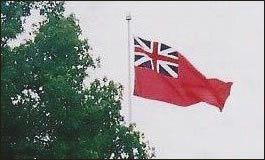 The replacement is called a “Dutchman repair,” and there were two areas in which the repairs were made. One repair was made to an interior upper level gun loop. The section of rotted wood was carefully removed from the timber and replaced with a newer piece. The new piece was glued in with wood epoxy and sanded down to match the remaining original timber. The replacement was stained to match the color of the original wood, thereby making the repair less invasive to the authenticity of the building. The “newer piece” was actually an old piece of white oak taken from a c.1830 barn in Ohio. The barn had recently been torn down, and Allegheny Restoration had saved the wood to use in future restorations, like that at the Block House. The grain of the new wood matched well with the grain of the original gun loop, which was also made of white oak. Aside from epoxy injections and Dutchman repairs, Allegheny Restoration also resealed open joints between the gun loop timbers where the old cement sealant had deteriorated. Foam backer rods were placed into the open voids prior to the sealant being placed over the joints. Soot was rubbed over the sealant to remove its shiny appearance against the wood. Finally, a borate-based preservative was applied to the exterior gun loops and the roof of the Block House to further protect the wood from water and insect damage. 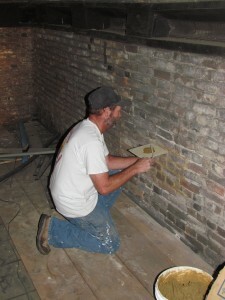 Jim from Mariani & Richards applies new mortar to a section of brick wall in the upper room of the Block House. Photo credit – Fort Pitt Society. 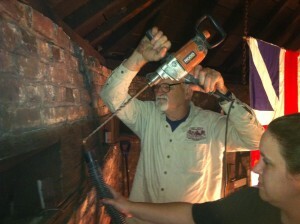 The next step in the preservation project for the Block House included masonry restoration and French drain repairs. This part of the project was conducted by Pittsburgh firm Mariani & Richards. M&R went throughout the interior of the Block House, restoring those areas of the brick and stone walls where previous mortar repairs were either poorly done or completed in a way unfitting for an 18th century structure. The mortar mix used by M&R for repairs was made up of the exact materials used in the original mortar from 1764, consisting primarily of clay and sandstone. Testing was previously performed on samples of the original mortar to determine its exact composition. Jon Smith of Allegheny Restoration applies a metal brace to one of the floor beams. Restoration work continued into early 2014 as the project focused the preservation of the floor beams of the second floor of the Block House. 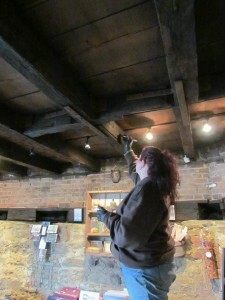 Many of the beams that support the upper floor are original to the 1764 construction of the building. Dirk Taylor, of Taylor Structural Engineering, designed steel braces to be installed on one side of the upper floor beams to increase their load capacity. Casey Young of Allegheny Restoration fills cracks in the floor beams with epoxy. Photo credit – Fort Pitt Society. Allegheny Restoration constructed and installed the braces, repaired cracks in the beams with epoxy and colored it to match the appearance of the timbers. The reinforcement was not intended to upgrade the strength of the floor to permit visitor access, but it will allow for the strength of several people to safely move about on the upper level of the Block House for preservation, maintenance, and/or storage purposes. Because of safety concerns for our visitors and to protect the integrity of the 250 year-old structure, guests have been prohibited from the upper floor of the Block House for several years and that restriction will continue to be enforced. To see press coverage of the entire preservation, including the X-ray exams, click here. 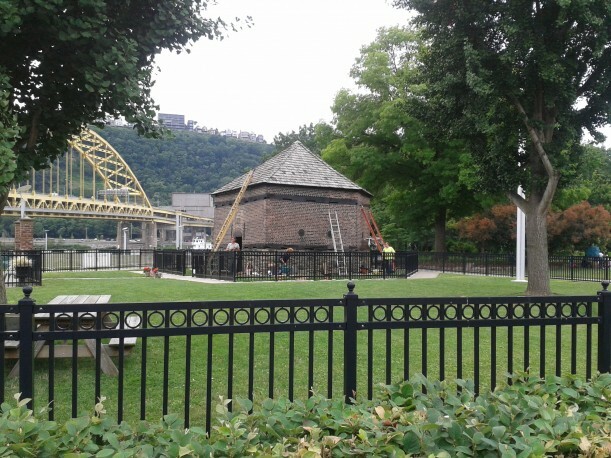 View photos of the entire preservation and restoration project for the Fort Pitt Block House on our Facebook page.